The staff always loved creative pranks of all kinds. That's one of the things I have to say I miss most not being in the TV business anymore. The creative juices were always flowing from a lot of the staff, particularly the production and news department. I don't know whose idea it was for Margaret Forrest, who did singing telegrams as the same time she worked in production, to greet me that day. I was ushered into the studio on some ruse of needing to see a leak in the building (so what else was new?). When I got thru the studio door, I see most of the staff gathered there, and knowing it was my birthday, I blushed knowing something had been planned and was going to "surprise me." As the staff began to sing "Happy Birthday" to me, Margaret (dressed in her French Maid outfit) came through the hall door into the studio and presented me with a gift and later a cake. I forget what was in the sack, but it was a gag gift of some type for sure. 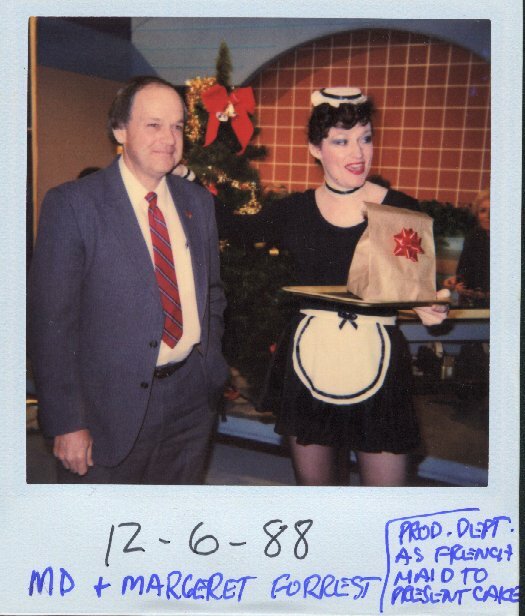 You will see the 1988 set of "Morning WAAY" behind us all decked out for the Christmas Season. Another memorable Birthday "trap" was held in the new conference room where I was summoned by Melody Rice (so it was early 90's) to come and I was suspicious and said I was not coming with her. She begged me and said even if I was right about another "surprise", I could not disappoint the people. Well, sure enough, as I walked through the door, there were all department heads and a good part of the staff standing behind the table and a lighted birthday cake was on the end of the table waiting for me. By then, the candles were just about burned down, as Melody had a hard time coaxing me to come there. But then, the crowning moment was the voice of Priscilla Cowing belting out "Happy Birthday, Mr. President" in her best Marilyn Monroe voice. She did quite an acting job and everyone was greatly amused, except Mr. President who had a red face. (Seriously, I later always enjoyed the fact that the staff cared enough to go to such trouble on my birthdays).